This is one such cake which was in my to-try list for long time. I am just over enthusiast to see the beauty of this cake. Best thing of this cake is you have no need to decorate this cake. It's own beauty is enough to bring smile on anyone's face. But I was very reluctant or I would say I was scared to try this one, as I thought it would be very hard to make the pattern. It is actually hard, but you have to be very patient and calm while making and if you really follow and understand the instruction, it will be very easy. 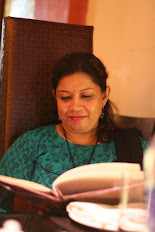 Few weeks back when Deepa of Hamaree Rasoi posted this cake, I was over-joyed to read her post and she explained this so simply, I didn't make any more delay. I collected all the ingredients and promptly made this cake. I am overwhelmed with the outcome. The taste, the look, the texture I got was divine and melt-in-the-mouth. I am going to make it more often. 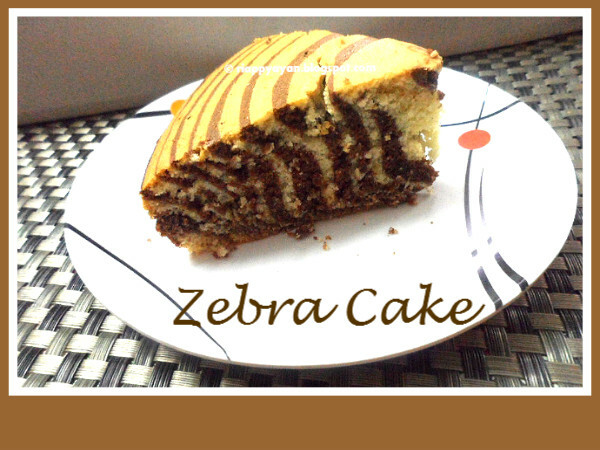 Go over to Deepa's Zebra Cake recipe to see her step-by-step pics n instruction. I totally followed her recipe, except I added extra 1/2 cup of butter in here. Cocoa powder : 2 tblsp. Prepare your baking pan by greasing with little butter and dust it with little flour. Dust off excess flour. Pre-heat oven to 180 degreeC or 375 degreeF. Mix together flour, baking powder and salt. Set aside. In a large mixing bowl, beat sugar and butter together until smooth. Add oil and beat again until sugar dissolves. Add eggs one at a time and beat together until smooth. Then add vanilla extract and mix well. Now add dry ingredients i.e., flour mixture in the sugar-butter mixture little at a time and beat. Mix until whole flour mixture is used. You add add milk in the batter now, if you find your cake batter is getting dry or it's difficult to fold. But use milk sparingly, as much needed to make a creamy batter. 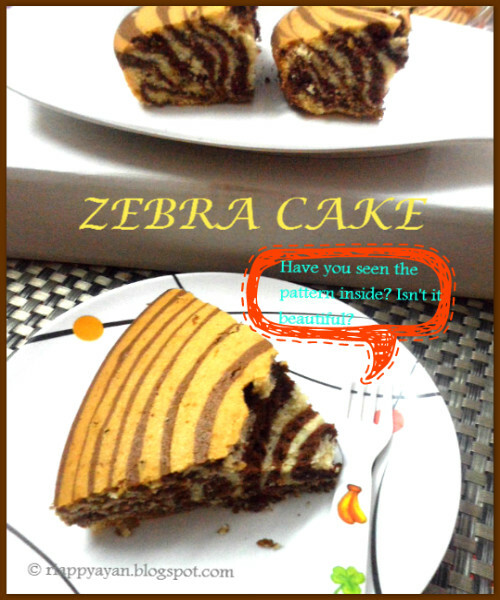 Note : To make Zebra cake, your batter should not be stiff, but creamy. After your batter is ready, divide it into two bowls. Keep one as it is and in the other half, mix cocoa powder and just beat a little to mix it well with the batter. Now it's time to make the Zebra Pattern for the cake. Take your prepared baking pan, drop 1 big ladleful of white batter in the middle. Wait a little as it will spread a little by itself. Then drop I ladleful of chocolate batter in the center of the white batter. Continue pouring alternate layer of batter until you are done with both the batter. Note : You can also use a piping bag to make the pattern or use a big ladle. 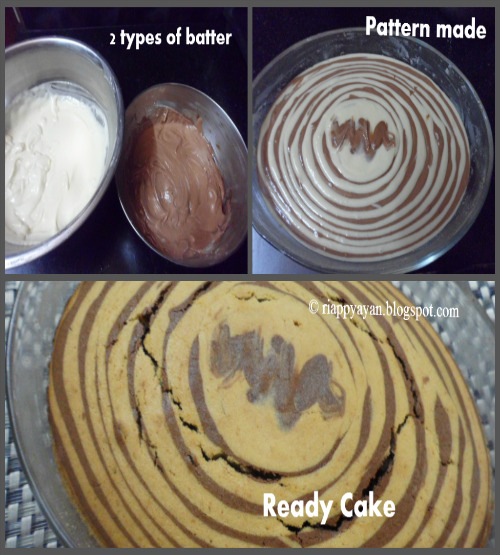 No need to tilt or rotate the pan to help the batter spread, it will spread by itself once you start pouring the batter and making the pattern. Once you are done, carefully transfer the pan into the oven and bake for 40-45 minutes or until a toothpick inserted in the center of the cake, comes out clean. Cool on wire rack, serve at room temperature. it looks so professionally baked..
Wow! Lovely Zebra Cake. Beautiful pics too! 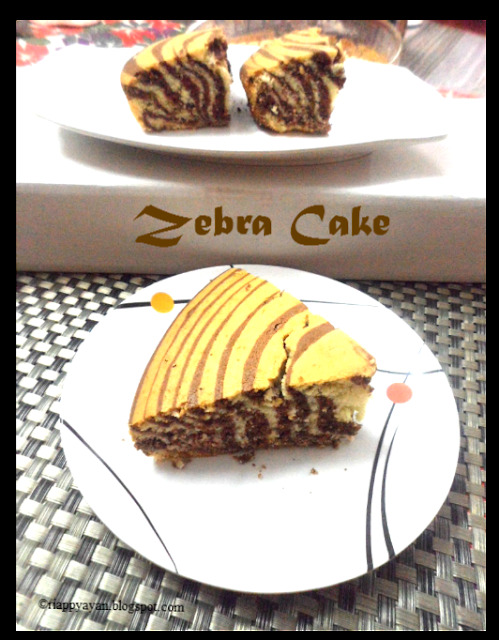 Amazing zebra cake, yummy and delightful.